The 1968 Mustang was an important year for the classic Ford muscle car for many reasons, including some major changes in engine specifications and power. pony car at the World's Fair, other manufacturers, were biting at their heels. General Motors, with high powered entries such as the Camaro, Firebird and Corvette knew a good thing when they saw it and kept the engineers at Ford very busy making sure that their pony car stayed on top. The styling of the 68 car was a combination of refining the new from last year body style and the addition of federally mandated safety changes, including rear side marker lights. And of course, the continuation of America's love for the legendary fastback styling first seen in the 1965 model year continued to be offered in a newly refined form in the 1968 Ford Mustang fastback . This option continued to be a very popular choice for both enthusiasts, and the only choice for use in Carrol Shelby's high performance Shelby Mustangs. The new regulations also mandated rear red colored side marker lights, which appear identical to those on the 1968 Cougar. For those liking the looks but not looking for high performance Mustang, there continued to be a straight 6 cylinder engine available. 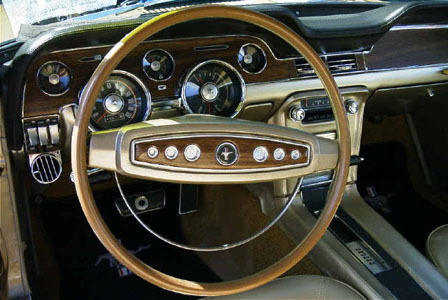 And for the more performance minded, small block V8 options and Big Block engine offerings were available, including a carryover 289 Ford V8 and the strong running 2 and 4 barrel 302 cubic inch V8 engines. 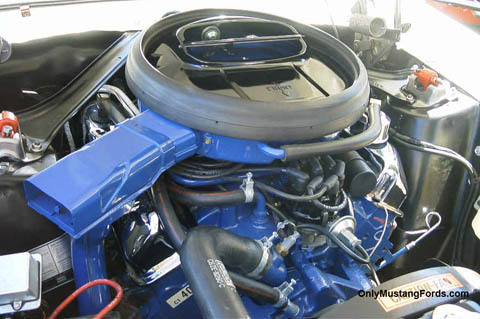 To fight the big block Camaro, Ford made sure that lots of power options were available and to complement the 390 cubic inch engines, which produced up to 335 horsepower, a new 428 cubic inch motor which they called the 428 Cobra Jet. 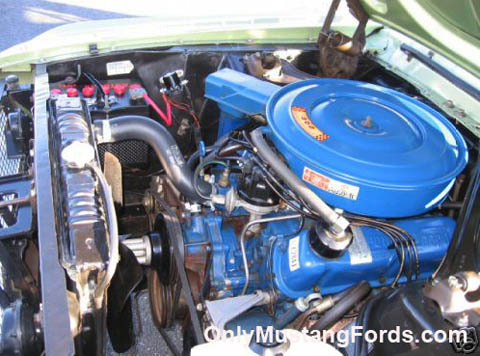 This new motor pumped out a strong 360 hp in 1968 Mustang trim and could be modified very easily for more. The option list also included a "smaller" 427 cubic inch V8 which just happened to make 390 horsepower. With the right equipment, this could be much higher, particularly with off the shelf parts from Ford's own parts department. Changes for the 68 Mustang's interior were minor, overall trim detail changed very little, however due to tightening national safety regulations, a new collapsing steering column was added in Mustangs, as well as other cars of the day and was designed to have a crush zone to absorb some of the shock of a (possibly non seat belted ) driver in an impact. lights and fiberglass rear quarter panel extensions that flowed into a spoiler attached to the fiberglass trunk lid, while the front of the car received different fog lights. The side quarter panels received special scoops and a Chrome California special script logo. These cars were only available in coupe form. To some, these were the "poor man's Shelby" sharing some of the looks of the famous Shelby Mustangs, but none of the performance enhancements. The 1968 movie Bullitt, garnered a lot of attention on the 1968 Mustang. 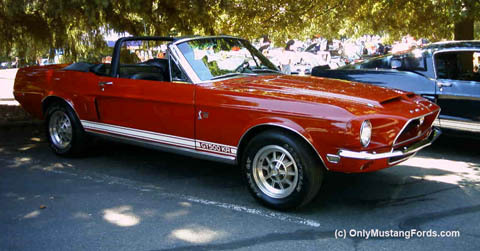 Superstar Steve McQueen starred in the movie, featuring a specially prepared Ford Mustang equipped with a 390 cubic inch engine which was a big part of the movie's success, with a wild street chase. 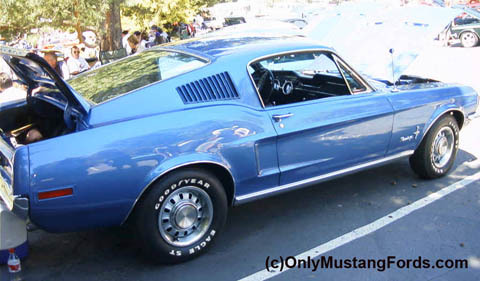 Interestingly, not only did the car's understated looks, styling and of course, performance catch the attention of many Mustang fans, it gained almost cult car status, leading to many 1968 Mustang fastback owners painting their cars the same Hyland Green as the movie car and sporting big block badges on the sides of smaller engined cars. It also led to the official "reintroduction" of the Ford Bullitt Mustang in 2001, which was badged and painted to pay homage to the famous pony car. Jump to Bullitt Mustang for more in depth information on all Mustang Bullitt cars. Here's a link to more information on what to look for when finding and fitting replica Bullitt Wheels and tires on your favorite Ford. Carrol Shelby was also busy making his mark on the public with the wild big block 428 powered GT500KR or king of the road. One of the signature styling touches which has been resurrected on the fifth generation Mustang convertibles and Cobras, first seen on the popular GT500KR convertible was the addition of this cool looking roll bar. Click on this GT500KR link for more information and pictures of this Camaro crusher. Need Parts? Click this link to jump to 1968 Mustang parts.